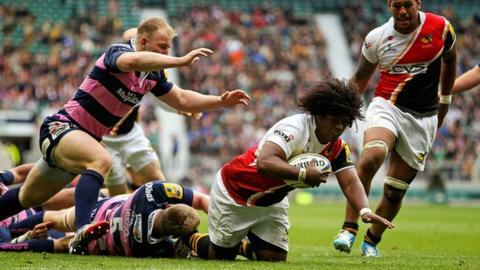 Wasps moved into the final European spot with a bonus-point win over Gloucester at Twickenham. James Haskell and Jonny May both crossed before Tom Varndell and Elliot Daly gave Wasps the advantage. Billy Twelvetrees kicked three penalties but the Cherry and Whites went in 24-16 behind at the break. Ashley Johnson gave Wasps a 15-point lead and, although it was reduced by Huia Edmonds and Freddie Burns, Haskell's second was enough to win it. With seventh-place Exeter losing heavily at Sale, Wasps moved up to occupy the final play-off spot for next season's European Rugby Champions Cup, leaving rivals Gloucester seven points behind in ninth. Wing Tom Varndell returned to the field after three months out with a bicep tear. Saturday's showpiece at Twickenham was the England international's first start since Wasps' win over Exeter in January . And Nigel Davies' side will be left frustrated after a series of errors let Wasps run away with the game, played in front of a 37,000-strong crowd in the Premiership showpiece. A stunning break from the impressive Nathan Hughes led to Haskell's opening score, the England flanker scrambling over - despite the defensive efforts of Rob Cook - and the television match official confirmed his touch down. But a handling error from Wasps allowed May to race over and, after the TMO refuted claims of offside, Twelvetrees kicked the extras. Andy Goode's penalty opened up a three-point gap and Wasps extended their lead further when they capitalised on Twelvetrees' misplaced pass and Varndell - on his return from three months out with a bicep injury - charged across the try line, with Goode adding a third kick. Twelvetrees made amends for his earlier error by landing two penalties but his side fell further behind as Chris Bell stormed through the open midfield and fed Daly, who raced over before Goode's conversion. Gloucester's England kicker added his fourth from the tee to make it 24-16 at the break. Will Helu was sin-binned early on in the second half for a deliberate knock-on but the Cherry and Whites could not make it count and they were soon 15 points adrift as Johnson powered over and Goode converted again. Having secured the bonus point, Wasps let Gloucester back into the game, Edmonds breaking from the ruck to touch down and Twelvetrees adding the extras. Wasps looked for the try to kill the game with 10 minutes remaining and Haskell forced his way over the line, with Joe Carlisle adding a single kick. But with Johnson in the sin bin for another deliberate knock-on, Gloucester responded again when Burns intercepted and ran over unopposed, with Twelvetrees converting to reduce the gap to eight points. Wasps went down to 13 men after Andrea Masi received a yellow card for blocking Charlie Sharples, but they managed to run the clock down to secure the win. Wasps director of rugby Dai Young: "We scored five tries and gave them two. We were very good in patches but very loose in patches as well. "We probably won that game four times over and the score flattered them. We made harder work of it than we needed to. "At critical moments of that game, our pack really stood up. Nathan Hughes was outstanding, Ashley doesn't know how to play poorly and was a bundle of energy. James Haskell was very good, but I'm sure he'll tell you that himself." "There were very fine margins today and from our point of view there were too many first-up missed tackles. "Our line-out did not function at all well and didn't give us a platform to play off, that was a big factor. "I thought there were elements of the performance that were good but again I would say probably they brought a physicality with their big ball-carriers which put us under pressure."